The Vivo X21 is a premium and futuristic smartphone with in display fingerprint scanner and impressive specifications. It has a dual camera and runs on latest Android Oreo OS. The performance is okayish. I feel that the battery is less at this price point. Overall it is nice phone and value for money. In display fingerprint scanner is smooth and fast. This is one of the best phone made by Vivo. holding this in hand literally feels like holding an high-tech sci-fi gadget. The in screen fingerprint scanner is very good. 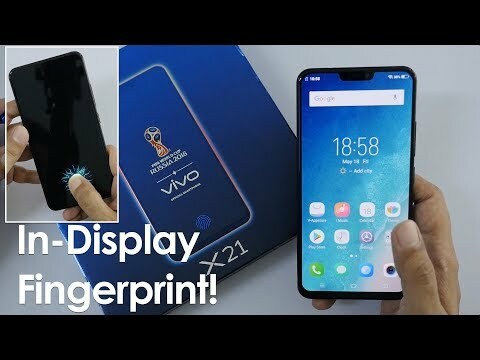 Vivo X21 is the only smartphone that comes with an in-display fingerprint sensor in the Indian market. I am using this device for a long time now and can personally say I am having an amazing performance. With recent updates, the fingerprint sensor now works perfectly. At this price range, the device has the best camera hands down. While the other aspects seem ordinary but if you need an impressive camera and fewer bezels then this is the phone you&apos;re waiting for. Vivo X21 is the first smartphone to come with the in-display fingerprint sensor. The smartphone has an amazing build quality, looks and feels premium in hand. The fingerprint sensor is one of the fastest you can find in a device. The cameras on this device are exceptionally great. It beats other flagship devices with ease. The rest of the specs of this device is great. If you&apos;re planning to go with it, go ahead and buy it. According to me, this phone is a little bit overpriced but you can still go for it no doubt. The in display fingerprint sensor is very fast and the company is improving with regular software updates. the cameras are so impressive that you will forget the phones like Oneplus 6T. I do hate the poor UI design and those cartoonish icons. Other than that, a perfect for you. 6 Pricebaba users have written their experience with Vivo X21. If you own Vivo X21, please do leave your feedback too. Lowest price of Vivo X21 price in India starts at Rs. 21,780 Vivo X21 is available on Flipkart at Rs. 21,780. Prices updated on 22nd April 2019. The Vivo X21 flaunts a 6.28-inch bezel-less display having a FHD+ resolution of 2280 x 1080 pixels. The Super AMOLED display panel offers vibrant colors and crisp viewing. There is a iPhone X like notch on the top. On the flip side, there is a vertical dual rear camera setup. The fingerprint scanner is located beneath the screen towards the bottom. For plugging in any audio accessories, there is a 3.5 mm headphone jack. The Vivo X21 ships in Black color. Camera is the main highlight in Vivo phones and this one is no exception. The X21 sports a dual rear camera setup comprising of a 12MP primary sensor accompanied by a 5MP secondary sensor. It is assisted by LED flash and PDAF system that aids in better photos in low light. On the front, the X21 has a 12MP snapper for clicking selfies. The rear camera offers Full HD video recording (1080p). Under the hood, the X21 houses a 2.2GHz Qualcomm Snapdragon 660 octa-core chipset. It packs a huge 6GB RAM for seamless multitasking and an Adreno 512 graphics processor onboard for lag-free gaming performance. For storing your data, the device offers 64GB inbuilt memory which can be expanded up to 256GB via microSD card slot for additional needs. Out of the box, the Vivo X21 runs on the latest Android 8.0 Oreo OS with Vivo’s custom Funtouch 4.0 OS layered on the top. The Vivo X21 draws its power from a non-removable 3200 mAh battery. It offers fast charging feature. The device offers dual SIM functionality and requires nano SIM cards. For networking, all the basic connectivity options like 4G LTE, 3G, 2G, WiFi, Bluetooth & VoLTE are included on this phone. 1. How is the camera performance of this phone? Ans: The Vivo X21 has a dual camera of 12+5MP so you can expect great quality images. Ans: Yes, nano SIM card will easily work on this device. 3. Does the phone have a Hybrid SIM slot? Ans: Yes, this phone features a hybrid SIM slot. 4. Does the phone support 4K video recording? Ans: No, the video recording on this phone is limited to Full HD (1080p). Ans: Inside the box, along with the device you will get accessories like charger and cable separate, SIM ejector tool and a user manual. 6. Does it support OTG? Ans: Yes, an OTG cable can be connected to the phone.